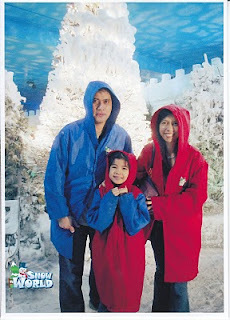 Chloe wished to go to Snow World. We were here for less than 10 minutes only. Chloe swore never to go back to this place again, hehehe... It was freakin' cold! I'll be posting our Days 3, 4 and 5 in Manila maybe tomorrow or in a few days. Thank you for viewing my blog. Have a great Thursday everyone!!! Hello Mommy COOKS... been a long time since I visited your site.. hahaha..Im not that active with blogging anymore because of some stuffs that Im currently concentrating. BTW, I have planned a trip in going to Manila to meet up Niko and Kitty Kat this coming March. We have our 5 day itinerary going to Batangas and Subic. Kat will be flying from Davao to meet me up in Manila. Im so excited, I wish we'll be able to meet up someday too. But after our one week trip in MNL, me and YL will be back to Taipei to continue our vacation over there before heading home to California. I didn't know you already moved to a new place. Pls post the house warming pictures so we'll be able to have some glances over your new abode. Take care Mommy Cooks... I missed you. Wow! I've never been to Mall of Asia. 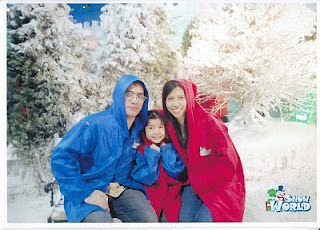 hehe Didn't know may Snow World pala sa Manila? That's nice Cooks! Happy vacation! omg!!! i so love chloe's sunglasses! so polyvorian!!! hehehe! luv ur pix cooks!! finally able to view it, after the very bz week!!! have a great weekend! mwah! Chloe is such a big lovely girl already, u look great too!